Mathematical Methods in Computer Aided Geometric Design II covers the proceedings of the 1991 International Conference on Curves, Surfaces, CAGD, and Image Processing, held at Biri, Norway. 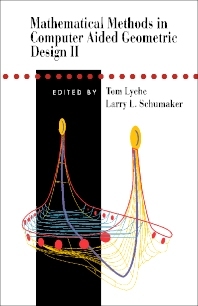 This book contains 48 chapters that include the topics of blossoming, cyclides, data fitting and interpolation, and finding intersections of curves and surfaces. Considerable chapters explore the geometric continuity, geometrical optics, image and signal processing, and modeling of geological structures. The remaining chapters discuss the principles of multiresolution analysis, NURBS, offsets, radial basis functions, rational splines, robotics, spline and Bézier methods for curve and surface modeling, subdivision, terrain modeling, and wavelets. This book will prove useful to mathematicians, computer scientists, and advance mathematics students.